P&B Weir Electrical Ltd supply Substation Earthing Leads with Aluflex cable for all earthing applications, all of our 150sqmm terminations are embossed with our name to ensure the highest quality. 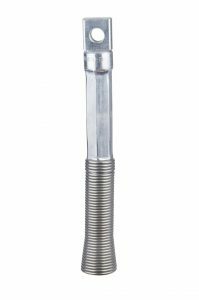 Aluflex earthing leads (ESI-C1-2T1) are produced from multi-stranded, commercially pure aluminium with an extruded pvc sheath to protect the cable from damage. 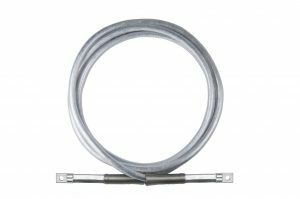 The flexible aluminum earth leads come with tested and approved compression terminations and support sleeves which are used for connecting a line end clamp and an earth end clamp. The flexible conductor is of a circular cross section made up of commercially pure aluminium wires, giving a nominal sectional area of 150sq.mm. Leads are also available in blue and green, solid, opaque or semi-transparent coloured PVC sheaths. Other colours are available on request. Earth leads can also be provided from flexible multi stranded copper 35, 70 and 95 sq.mm as an alternative to aluminium leads.